Then Kaizer Chiefs goalkeeper Arthur Bartman in 2012. 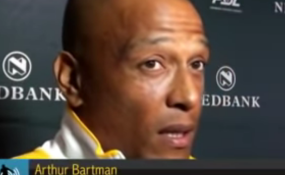 Cape Town — Former Kaizer Chiefs and Maritzburg United goalkeeper Arthur Bartman has died at the age of 46, Sport24 reports. Bartman's death was confirmed by his hometown club, Maritzburg United, who he served as a player and later as a goalkeeper coach after announcing his retirement. The cause of Bartman's death - was born and raised in Pietermaritzburg - was not confirmed by the club, Sport24 reports.